The next day we pull down the building bin and gather around the table to find out what the next build challenge is. We happily get to work. There are masterpieces of varying levels and sometimes we all join forces to create THE super build of the day. These are common scenes in our home. 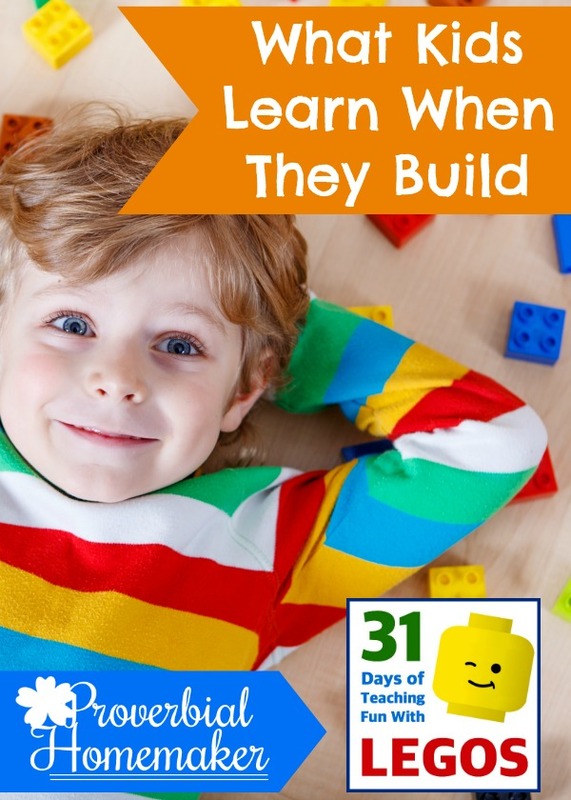 With boys and girls that both love to build, this mama is taking advantage of ALL the great skills and learning opportunities that Legos and other building toys provide. Problem Solving. Finding ways to make little squares and rectangles (or whatever building shapes are available) match what is in their head is a real challenge! Kids flex their problem solving muscles to implement solutions that fit the challenge at hand. Focus. In order to complete a build project, kids have to remain focused or it won’t get done. This can be a challenge for some children, but the appeal of Legos, K’nex, and other toys keeps their interest so that they persevere. Perseverance. Yes, that is an important character trait to develop! When an idea does’t pan out or the toddler destroys it mid-way (which of course Mom goes to deal with), kids learn to evaluate, pick up the pieces, and keep trying until they’ve completed the task. This is such a valuable lesson, and a great time to chat with kids about patience and finishing what they’ve started. Confidence. When they’ve successfully finished a build project and accomplished what they set out to do, kids can gain healthy confidence. They learn that their creation may not look exactly like another’s, and that’s ok. They learn that they CAN do the job if they focus and persevere. They learn that there will be more chances later, so perfectionism isn’t required. These are all good things! Planning/Forethought. When presented with an idea or a build challenge, kids need to think ahead on how they can accomplish it with the given materials. They need to plan out what to build first, how different sub-parts will fit together later, etc. Obviously, these skills carry forward to other areas of life where they will need to decide how to tackle a task or problem. Engineering. The existence of gravity will help build projects become lessons in engineering. Kids will learn about things like sound structure, loading, tension, bracing, and scale. They might not know the terms (unless you teach them) but they will definitely become more aware of the principles. Following Directions. Lego kits come with instructions that the kids have to follow in order to create the designed result. While open play is fantastic, these projects are great for teaching kids to follow instructions and also expose them to various brick combinations they’ll use for future open play builds. In addition, when that car door won’t open because they weren’t diligent in following instructions, you can be sure they’ll pay closer attention next time. Sharing and Collaboration. Plopping a bunch of Legos in the midst of a group of kids makes for an instant lesson in sharing, just in case you needed one more opportunity. 🙂 They also create wonderful arenas for practicing collaboration. Kids learn to communicate and listen clearly, share ideas, and of course practice their manners. Doing a build challenge WITH your child is a great way to connect as well! Playing Alone. We want our kids to learn how to play alone. The ability to keep themselves entertained with constructive play is a valuable skill in itself. Think about when they need to wait patiently, need to take a break from the busy day, or when you need a little quiet time yourself! Legos are perfect for this purpose. Responsibility. Legos are expensive (relatively speaking) and keeping good care of them and other bolding toys is a good lesson in responsibility. Set your kids up for success in this area by having a simple and easy storage solution and then require them to keep their building toys neat and tidy. You will be doing them (and your feet) a favor! More! Studies like this one and this one suggest that playing by building can have lasting benefits for kids who start early. 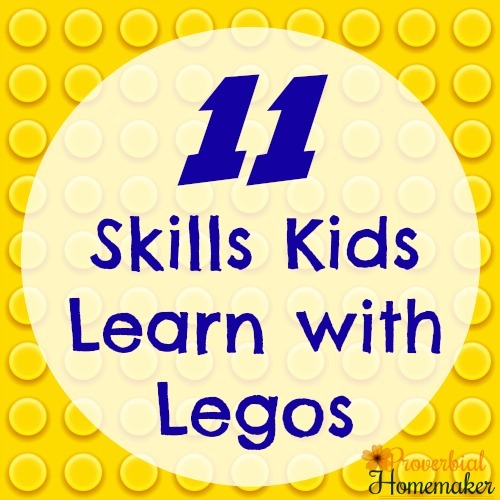 The above skills are only a few of the things you can teach your kids with Legos. There is a vast number of ideas you can find on Pinterest for teaching with them for different subjects. Kids will learn fine motor skills, early math (sorting) skills, take advantage of hands-on learning, and so on. You can also find more Bible Lego Challenges at Proverbial Homemaker. 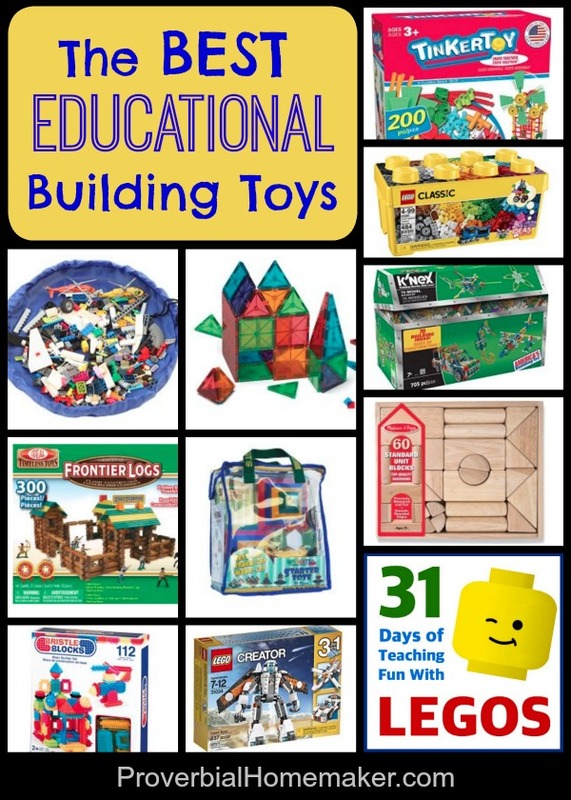 Or check out this fun post on the best educational building toys for kids! Kids learn so much with legos. If you ever get the chance ti visit a lego store you should. The pick a brick wall is awesome and they do a monthly lego build similar to Home Depots free each month. We have one nearby! Although I didn’t know about the monthly Lego build. Thanks! Will have to check that out. My son is a huge Lego lover! He was building pulleys and lever systems with Lego’s before he ever knew the names of pulleys and levers. Lego’s are awesome!